What is Coxa Saltans or snapping hip? Coxa Saltans, snapping hip or a clicking hip, is a condition in which a visible or audible click is produced around the hip joint. There are two types: an external click and an internal click. Both types can be accompanied by shooting pain. An external click or external snapping hip (coxa saltans externa (1)) is caused by the tensor fascia lata tendon band snapping over the greater trochanter. This click is mainly visible on the outer side of the upper leg. This sensation is often described as though the hip could dislocate (come out of the socket) although this condition is completely separate from the hip joint. An internal click or internal snapping (coxa saltans interna (2)) is mainly audible and is caused by a snapping of the iliopsoas tendon against a protrusion of the pelvic bone or femoral head. The pain caused is located in the groin. The treatment for a snapping hip or clicking hip is initially conservative and focuses on physiotherapy. With your physiotherapist attention is primarily devoted to stretching the muscle concerned, whether it be the tensor fascia lata, or the iliopsoas. This could be combined with a local infiltration with a small quantity of cortisone and possibly with an ultrasound. If conservative treatment fails, (keyhole) surgery may provide relief. 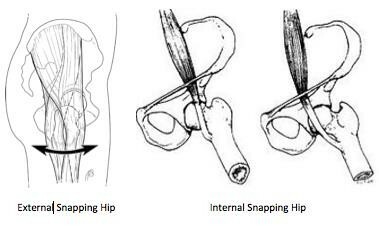 In the case of an external snapping hip a diamond-shaped cut is made in the tendon band of the tensor fascia lata to relieve the pressure. In the case of internal snapping the tendon of the iliopsoas muscle is extended to relieve pressure.